Sam Shepard was one of this country’s leading playwrights, as well as an esteemed actor and director. His death earlier this year deprived the theatre of one of its leading lights. Shepard was the winner of an unprecedented ten Obie awards, as well as the 1979 Pulitzer Prize for his play Buried Child. Prior to his passing, Chicago’s A Red Orchid Theatre Company mounted a 2013 production of Shepard’s play Simpatico, set in the sleazier side of the world of thoroughbred horse racing. Now, in association with the McCarter Theatre Center in Princeton, they are offering a new production of the play as a tribute to Shepard. Unfortunately, Simpatico is one of Shepard’s lesser, and lesser-known, efforts, and this production does not make up for its deficiencies. At the beginning, we find Vinnie and Carter, meeting at the motel where Vinnie lives in Cucamonga, California. They had been partners in the past, and Carter has been paying Vinnie’s expenses ever since. We find out that, at the end of their partnership, Carter took both Vinnie’s car and Vinnie’s wife, Rosie, settling down in Lexington, Kentucky. We also learn that whatever they did involved blackmail — and Vinnie is in possession of the evidence. The play bounces back and forth between southern California and Kentucky, with scenes between Vinnie and Carter, Vinnie and Rosie, Carter and Vinnie’s new love interest, Cecilia; Vinnie and Simms, a thoroughbred genealogist; and Simms and Cecilia. The play ends with a final meeting between Carter and Vinnie — but is it real, or is it an alcoholic figment of Carter’s imagination? Set designer Grant Sabin and lighting designer Mike Durst have come up with a clever use of sliding set pieces to get us from one location to another quickly and easily. 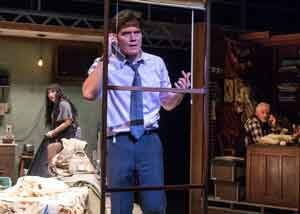 The musical selections of sound designer Joe Court comment perfectly on the action of the play. 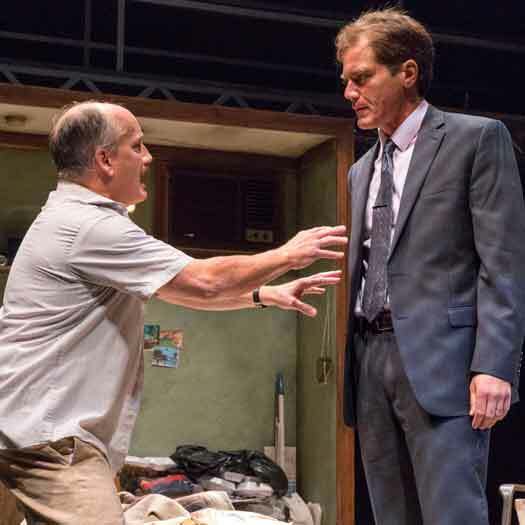 Those who are fans of Sam Shepard’s plays should make the trip to Princeton to see Simpatico. Otherwise, while this was a tribute to Shepard made with the best intentions, the average theatergoer would probably not enjoy a play that seems incomplete and not quite alive. 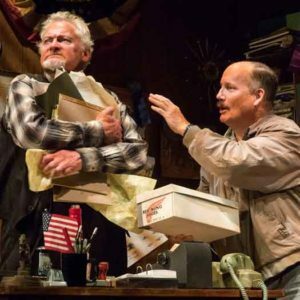 Simpatico is presented by the McCarter Theatre Center at the Roger Berlind Theatre on the campus of Princeton University through October 15, 2017. For tickets and information, visit mccarter.org.